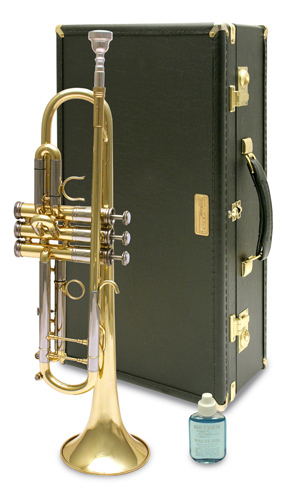 The 3050 trumpet is designed for the serious high school or collegiate player. With its standard #125 mouthpipe and #137 one piece, hand hammered yellow brass bell, it produces a full, brilliant tone with excellent intonation from low to high. The standard .459 bore and square tuning slide provide moderate resistance, allowing a player to lean against the horn. The heart and soul of every Getzen Trumpet is the valve section and the same legendary Getzen valve action can be found on all of our trumpets. That is in no small part thanks to our hand-lapped, nickel silver pistons, arguably the fastest and most durable pistons on the market today. Finally, every Getzen Trumpet is hand mounted and assembled by highly trained craftsmen and women. The same care is put into every trumpet that goes through the factory. Whether the trumpet was built in the ProShop or in general production, you can rest assured that it was made by some of the most skilled hands in the industry. Widely regarded as the best valves in the business, Getzen supply a lifetime warranty on the custom series valves. Lacquer finish, .459 bore, hand lapped yellow brass slides, square crook main tuning slide, 125 yellow brass mouthpipe, 137 hand hammered one piece yellow brass bell, first valve saddle, third slide ring, deluxe hard case. Getzen Platimun Warranty.